One of the last Marine fighter pilots to become an ace in World War II, Dean Caswell was born in Banning, CA on 24 July 1922. He attended Edinburg Junior College at Edinburg, TX prior to joining the Marine Corps in September 1942. Following graduation from flight school at Pensacola, FL on 16 December 1943, he was sent to Jacksonville for operational training in the 4U Corsair. Subsequently assigned to the VMF-221, Lieutenant Caswell participated in strikes launched from the USS Bunker Hill against Japanese airfields on the island of Kyushu. He scored his first victories – three Mitsubishi Zekes – on 18 March while attacking Tomitaka Airfield. On 12 April, Caswell downed another Zeke over Kikai Shima as the action shifted to the Okinawa area. On the 28th, while on a combat air patrol 150 miles north of Okinawa, his flight of three Corsairs, led by 1st Lt. Joseph Brocia Jr. was vectored toward 25 Zekes that were headed toward Task Force 58.3 and Okinawa. 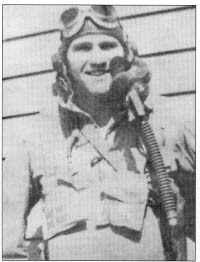 The three met the Japanese fighters at 22,000 feet and Lt. Brocia dove to the deck after one, leaving Caswell and 1st Lt. John McManus to take on the rest. In the twisting, turning battle that ensued, Caswell and McManus downed three each and Brocia was credited with two. Following the War, Caswell served as a carrier-based F4U pilot until 1950. He served two tours during the Korean War, flying night-fighter F7Fs and F4Us, as well as the F3D Skynight. In January 1964 he became commanding officer of MACS-6 and later VMF-333. He subsequently qualified in all fighter aircraft in the Marine inventory, flying the F-8, A-4 and F-4. He was deputy chief of staff for Marine Air Group 32 when he retired as a colonel in 1968.